The Nestucca Ridge family of companies leaped to mind right away. 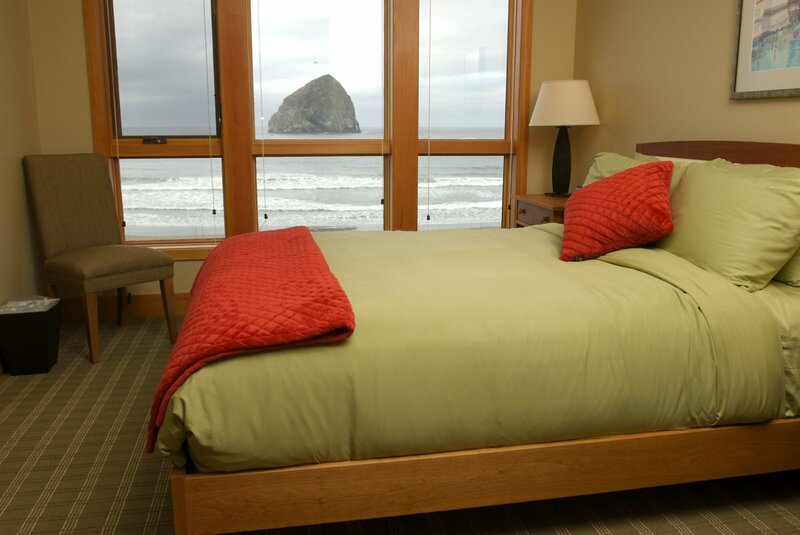 The Cottages at Cape Kiwanda offer an unparalleled view of Pacific City's Haystack Rock. Four months later, we found ourselves representing Nestucca Ridge, specifically helping to promote a one-day sales event for the companies Cottages at Cape Kiwanda. Working with Nestucca Ridge founders and principals Mary Jones and Jeff Schons, as well as their staff, is a fun and interesting assignment. It’s the kind of thing that made us want to pursue this business in the first place. Based in Pacific City, Nestucca Ridge is composed of the Pelican Pub & Brewery, Inn at Cape Kiwanda, Stimulus Espresso Café, Shorepine Properties, Pacific Seawatch and Cottages at Cape Kiwanda, among other businesses. 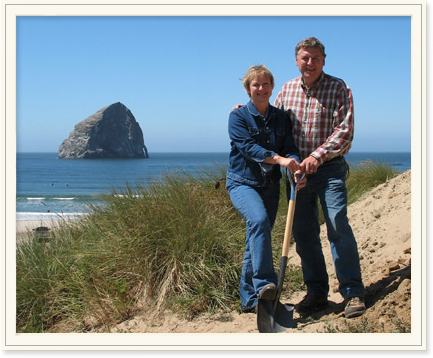 Mary and Jeff, who moved from the Portland area to Pacific City in 1990, had the foresight to build the Pelican Pub & Brewery, the first locally owned brew pub on the Oregon coast in 1996. (Rocky’s LeeAnn wrote a frontpage feature story about Brewmaster Darren Welch for the former “County Line,” a Tillamook County-wide publication in 1999.) Since then, the pub, under Darren’s watchful eye, has garnered dozens of international awards and spurred a craft beer boom on the Oregon coast. Mary, Jeff, Darren and fourth partner in the pub and brewery, Ken Henson, are currently in talks with the Port of Tillamook Bay, City of Tillamook and Tillamook County in hopes of building a second Pelican Pub & Brewery on Port property bordering U.S. Highway 101, just south of Tillamook. Mary Jones and Jeff Schons. And we certainly can’t leave out the Cottages at Cape Kiwanda, which, through fractional ownership, offer quality craftsmanship, breath-taking views of Haystack Rock and Cape Kiwanda, concierge service and luxury in every room. We admire Mary and Jeff for their vision and care in creating unique businesses in one of the Oregon coast’s most beautiful and unusual communities. Over the years, they have contributed financially and through donations of goods, services and time to many Tillamook County (specifically south Tillamook County) charitable causes and continue to be one of the largest employers in the county. Posted by rockyintertidalcocreative on January 7, 2012 in Uncategorized.